I like to make up dishes while I’m standing in front of my fridge in my pajamas. As much as I LOVE grocery shopping (I’ve been known to go to the store multiple times in one day) I also fly wildly to the other side of the spectrum and let the grocery shopping go so long between trips that the fridge only has eggs and random sauces. Not that I’m complaining. As long as I have eggs I’m a happy camper. When you have eggs, you can basically make ANYTHING. 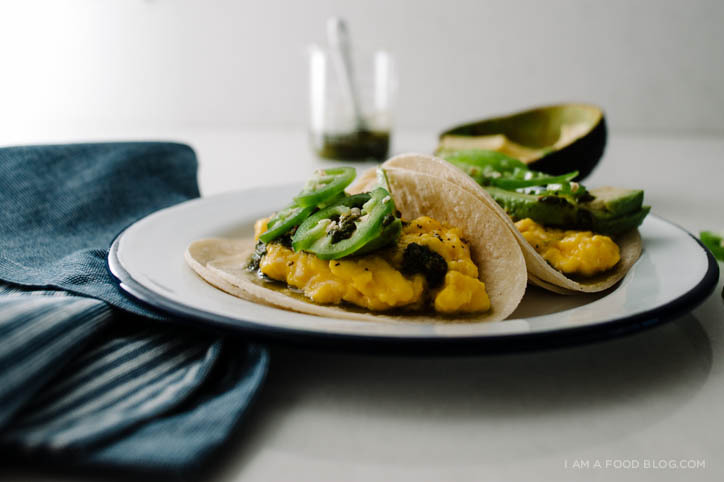 Even simple scrambled eggs get me egg-cited (sorry, not sorry for that horribly overused pun) so it’s not hard to imagine how giddy I get when I tuck soft scrambled eggs into charred tortillas and top them off with avocados, jalapeños and a little bit of green sauce. To be honest, the only issue I had with these tacos is that I didn’t char the tortillas enough. I was a touch too impatient. Do you guys ever get so hungry that you end up eating like a monster? I’m talking about food all in the air like you just don’t care – you just want it in your tummy two minutes ago. Yeah, that was me. Thankfully these were extremely satisfying. So simple, so easy, so delicious. 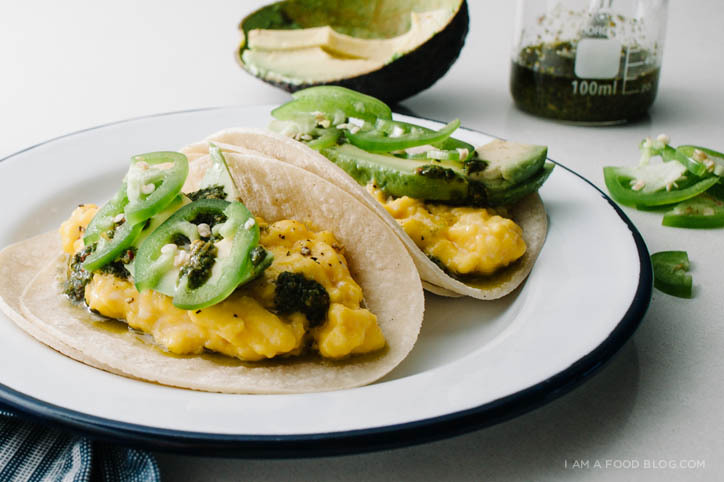 I am scrambled, I am tortilla-hugged, I am Egg and Avocado Breakfast Taco! Scramble your eggs – I usually do a nice slow scramble, which basically means that I cook them over low to medium-low heat while stirring constantly. To make your tacos scoop some eggs (don’t forget to season them!) onto your tortilla shells. Don’t forget to give them some heat first! You can straight up char them on your gas burner or you can do it in a dry pan, 1-2 minutes per side. I like to double up on the tortillas because I’m greedy like that. Top with some avocado, jalapeño slices and salsa. Easy peasy! breakfast tacos are a perfect food. oh gosh, yes. i totally agree! as i was reading this i was like, omg, we’re the same person. i go for days only eating eggs! they are eggsellent! also i love that little beaker you use for the salsa! molly, i am jelly because if you’re out of eggs in the fridge you can just walk on over to your chicken hutch and get some fresh ones. do you have your chickens yet?!?! i’ll bet you’ll be egg-static when you do! 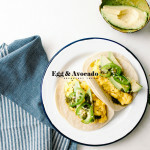 These breakfast tacos look amazing! Seriously, magazine-worthy shots. Love them! This is my all time favorite breakfast. I love to start the day with avocado. i eat so many avocados that i fear i am going to turn green soon…they are the best way to start the day though! With my husband working nights, I do a lot of standing-in-front-of-the-fridge, wondering, and cooking-for-one dinners, myself! Eggs almost always come into it. And rice. A lot of kim chi fried rice with eggs. But I always have tortillas on hand! 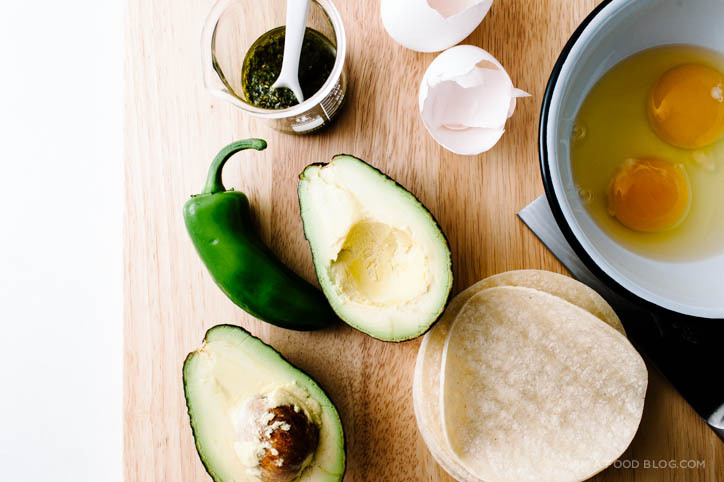 This is perfection — salsa verde, gimme! 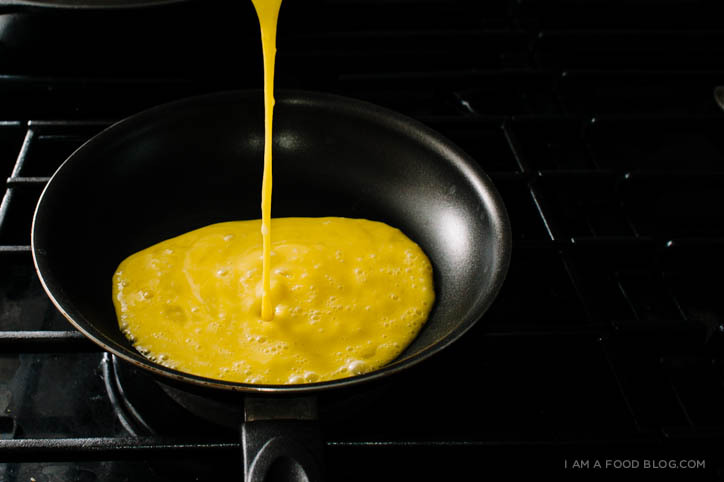 I love your photos — especially the eggs going into the skillet. (And I love your dishes, too!) I could probably survive (happily) for days on just eggs and avocados. 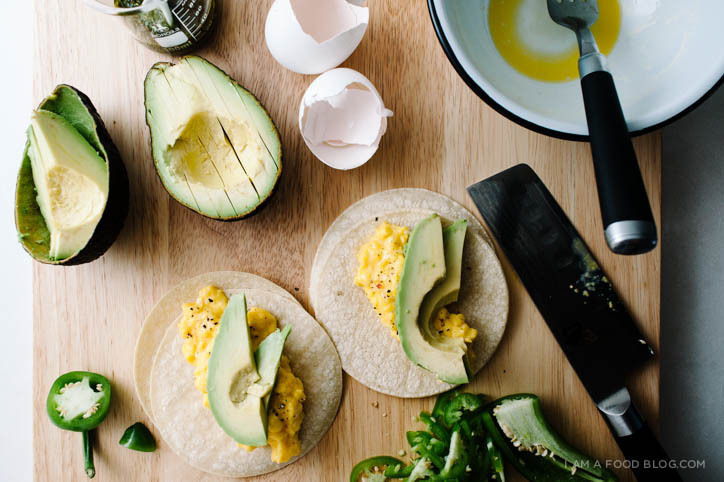 This is definitely the simplest and the best kind of breakfast taco there is. thanks allison! i totally agree. eggs are my go to favourite ingredient. and avocados. and green onions. so many possibilities! Saw your Instagram posting and just made the breakfast tacos. I don’t have any salsa so I used sirracha instead. It was delicious! Thank you for all the recipes and the beautiful pictures. woah, your camping is on another level! :D and yes, bacon is most definitely a perfect addition. It’s true–charred tortillas are of the utmost importance when making tacos. :) I love the combination of avocado and egg here! Such a satisfying and delicious taco. I’m totally egg-cited too ;) This recipe is lovely! I know what’s for breakfast at my house tomorrow! Bonus, I have everything on hand. Thanks for the inspiration. Sometimes, the whole standing-in-front-of-my-fridge part is my favorite time of the day. I love the luxury of not having to rush out, of calmly deciding what to cook. Then, of course, the hunger kicks in. yes! it’s one of my favourite places to be, in front of the fridge. :) hunger happens to me waaaay too often. Stephanie, I am sorry for never stopping here to tell you how awesome your website design is. It just works in every single way. I love it and the pictures are awesome. That said, I had this kind of tacos a couple times while living in NY and I love them! too bad I can’t find Jalapeños and salsa verde (or tomatillos) at all here. MEH. Well, I’m gonna take the chance and stuff my face with Tomatillos while in Cali. valentina, thank you! i can’t take credit for the design (my husband is behind that) but thank you! It’s so simple and sounds delicious! I want to try it! hope you get a chance to amy! I love love love breakfast tacos! These sound soooo tasty. Great photos and simple recipe! Simple recipes are the way to go! What foodie dreams are made of… You would be such great breakfast company, Stephanie! Wow. You can create this on a bleary-eyed morning? You legend. With my head resting wearily on the upper cupboard, the best I can do usually is to not burn the porridge. Oh, I have burned stuff before…usually, but not always limited to mornings! how have i never thought of this! 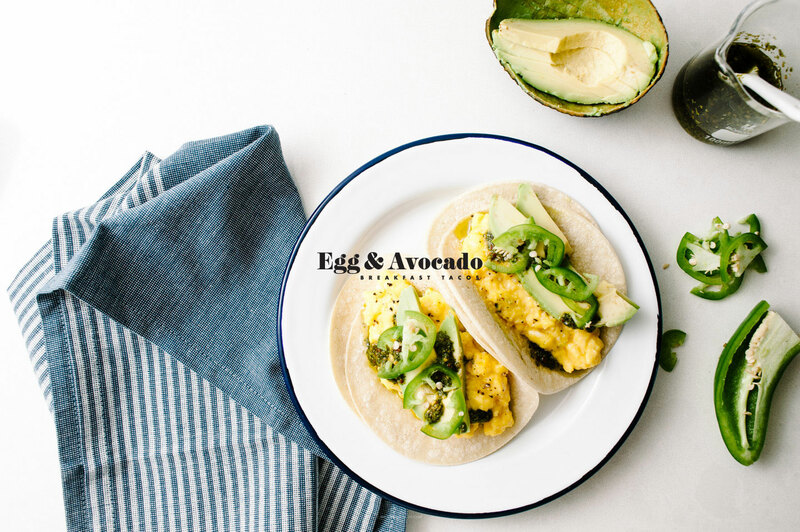 avocado, egg and taco’s sounds like a winning combination! Even just eggs and avocados are DELICIOUS!! I am into this. Gonna have to give this a go. Well I was wrong, this is absolutely great!!! I added some lime and made the tacos myself, and yeah I just couldn’t stop eating haha! Thank you heaps! Can’t wait to make it again!